Writing an article, or reviewing our software? Get in touch! We’d love to talk to you and provide you with specific information and bespoke images to meet your needs. If you’re in a real hurry – then go ahead and use the images below (right click to download them). Contact us at press@emailstopwatch.com for general PR inquiries. Make more money - Consultants almost always undercharge for emails because they’re not sure of the accurate amount of time they spent on them. It allows consultants to confidently charge their hourly rate for emails. Removes one of the hassles from your day – No more going through Outlook at the end of the day to see where your day went. Happier Employees – Makes one of the most painful parts of their day easier. Using better systems to keep your office running smoothly. 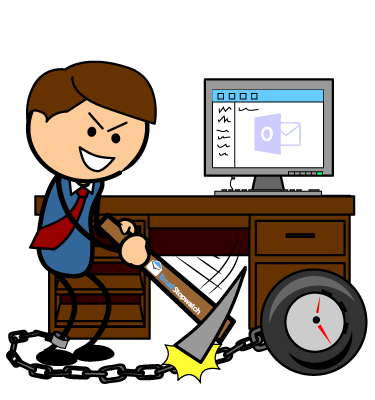 More Productive Staff – Know what staff are doing in their inboxes and make your staff more productive. Our data center is located at 151 Front Street. Canada’s premier telecommunications hub with 24x7x365 security, trusted by, and home to companies like: Bell, Rogers, Verizon, IBM, etc. We use the latest Dell servers with the latest Cisco ASA next generation firewalls. For email, our SMTP supports Transport Layer Security (TLS) protocol which is certificate-based authentication and helps provide security-enhanced data transfers by using symmetric encryption keys. Email Stopwatch started because of a software entrepreneurship course. My job was to find a problem in an industry that could be solved with software. I wanted to work with consultants because it was much easier to communicate the value of systems and software to them. Initially I explored other industries, like dog dogcares and caterers, but most didn’t understand the concept of creating systems and using software to make life easier and more efficient. Other industries would rather spend 5 hours doing something by hand then pay for a $9/month solution that would make it easier for them. Consultants were more practical and were willing to invest in solutions that made their life easier. I started by meeting with local consultants and learned a lot about their business, their struggles and their day to day. After about 2 months of talking to different business owners, the idea came about after hearing how many were swamped with email in the last few years. We realized that consultants had a hard time charging for that time and were always undercharging because they couldn’t track the time properly. Eventually I worked with a few companies that helped me flush out the idea and how it should work. We launched in February 2014 and have been growing since. Laura has a Master of Science from Ryerson University and a Bachelor of Science from University of Windsor. She has always had an entrepreneurial spirit and started her first business in university. She still has a love of science but spends most of her time now studying software, online business and marketing. Stan has over 20 years of experience in designing business solutions as a business analyst and software architect. Prior to joining Email Stopwatch, Stan has been specializing in implementation and integration of line-of-business applications for variety of companies, ranging from Fortune 500 corporations to desk & phone businesses. He has a Master of Science in Applied Mathematics and Computer Science from Moscow Institute of Physics and Technologies and an MBA from HCMS, Moscow.